The Marvel Cinematic Universe keeps getting bigger and bigger, with this year set to be the first where Marvel Studios will release three movies in a calendar year. The studio will kick off the summer movie season with Guardians of the Galaxy Vol. 2 on May 5, followed by the highly-anticipated Spider-Man: Homecoming on July 7 and Thor: Ragnarok on November 3. The studio will also start production on Black Panther in just a few short days, but today we have word that the studio is planning on shooting the highly-anticipated sequel Ant-Man and the Wasp this June in Atlanta. While we don't have an exact date at this time, it will give the filmmakers over a year for filming and post-production before its July 6, 2018 release date. A listing at My Entertainment World confirmed the production start for Ant-Man 2. While no specific locations were given, the production will likely utilize Pinewood Atlanta Studios, which is where the first Ant-Man was shot. Marvel sequels Captain America: Civil War and Guardians of the Galaxy Vol. 2 were also shot at Pinewood Atlanta Studios, along with Chris Pratt and Jennifer Lawrence's new sci-fi thriller Passengers. With production starting within the next six months, hopefully we'll have more news about the story and additional cast members. Paul Rudd returns as Scott Lang/Ant-Man, along with Evangeline Lilly as The Wasp, whose new suit was shown during one of the Ant-Man post-credits sequences. It was also recently confirmed that Michael Pena will return as Luis, but it isn't known if other Ant-Man stars such as T.I., David Dastmalchian and Michael Douglas will be back to reprise their roles. Michael Douglas has said in the past that he would like to return, provided that he wasn't given nearly as much exposition in the sequel as he was given in the first movie. Peyton Reed will return to direct, with a familiar team of writers working on the script. In December 2015, we reported that Paul Rudd will team up with Ant-Man production writers Gabriel Ferrari and Andrew Barrer, who will all co-write the script based on a story they have developed with Adam McKay. While Gabriel Ferrari and Andrew Barrer didn't receive screenplay credit on the first movie, they worked on the script for six months while the movie was in production. Paul Rudd revealed in August that he had finished his treatment, but it remains unclear if the whole script is finished yet. There was also a rumor that surfaced this past summer that revealed Sharon Stone had signed on to play a mysterious character with heat powers in an unidentified Marvel movie. 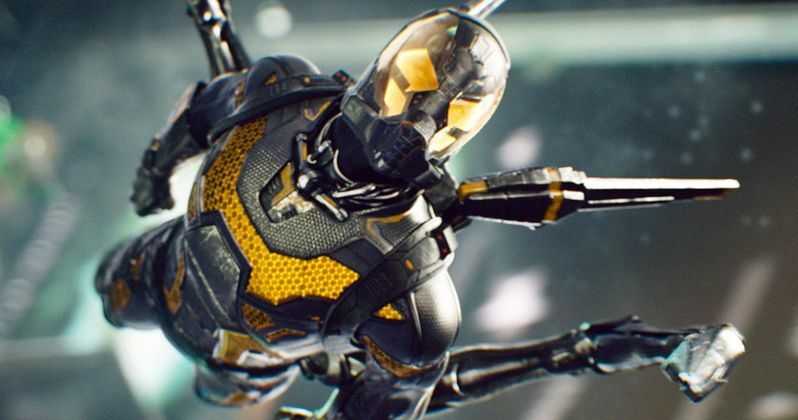 Many have speculated that this may be the original Wasp, Janet Van Dyne, the wife of Michael Douglas' Hank Pym and the mother of Evangeline Lilly's Hope Van Dyne. Her involvement in Ant-Man and the Wasp or any other Marvel movie has still not been confirmed yet, but we'll keep you posted with new updates as soon as they come in.